"Fluency is important because it provides a bridge from word recognition and comprehension." For students with special needs, especially nonverbal students, fluency can be a difficult skill to target and master. Using Core Vocabulary to help students with special needs master fluency is where is all begins. 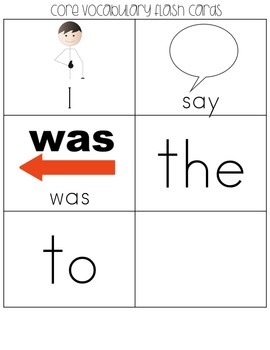 Use to practice simple sentences with core vocabulary words and to build confidence in reading and communicating. Core Vocabulary instruction is the beginning building block to not only building a fluent reader, but also a student who is a productive, independent member of the school and community. What Core Vocabulary words are focused on in this set? Say and with. Other frequently used words include I, to, and the. 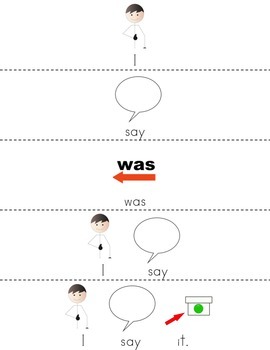 • 2 Leveled sets of SPED Strips (for "say" and "with"). • Level 1 includes only pictures. • Level 2 includes pictures and words. DOWNLOAD THE PREVIEW TO GET 2 FREE PAGES. 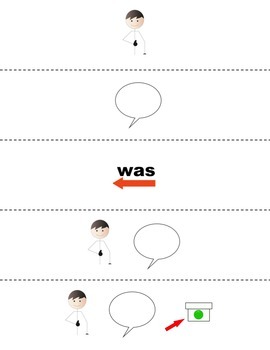 • Building Fluency Strips -- Uses words from Set #1, Set #2, Set #3, Set #4, and this set in sentences to practice core vocabulary and build fluency (want, go, can, see, have, need, like, come, say, with). • Flash cards for the key core vocabulary words being practiced. 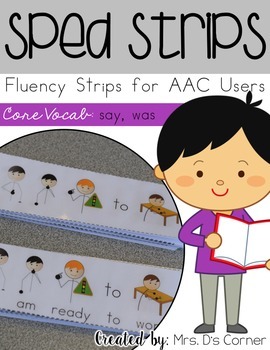 • Comprehension flash cards for all vocabulary used within this set of SPED Strips. Includes 40 SPED Strip sentences on each level. Includes 10 Building Fluency SPED Strips on each level.